Advisors need to manage investors fears to help them avoid irrational decisions during times of high market volatility. A common goal for financial advisors is constructing a portfolio that successfully aligns with the investment objectives of the individual investor. Most advisors focus on constructing a traditional portfolio expected to generate a total return consisting of an optimal blend of current yield and capital appreciation. But relatively few advisors take into account what we know about the emotional factors that powerfully influence how most investors actually behave. Unfortunately, this oversight can have a significantly negative impact on ultimate investment results. Traditional portfolios and fear-based selling have caused many investors to miss the mark when it comes to long-term returns. Unfortunately, investors usually do the wrong thing at the wrong time. As the market statistics demonstrate, investors persistently buy when the asset price is high and sell when the price is low. (Source: DALBAR’s 20th Annual Quantitative Analysis of Investor Behavior 2014.) Since this approach is likely to promote losses rather than gains, why do investors usually behave this way? Volatility evokes emotional reactions that often result in irrational investment decisions. There is a strong temptation for fearful investors to “join the bandwagon” by selling assets during a downturn. Nothing tests an investor’s tolerance for risk like the stressful, real-world situation of a market downturn. 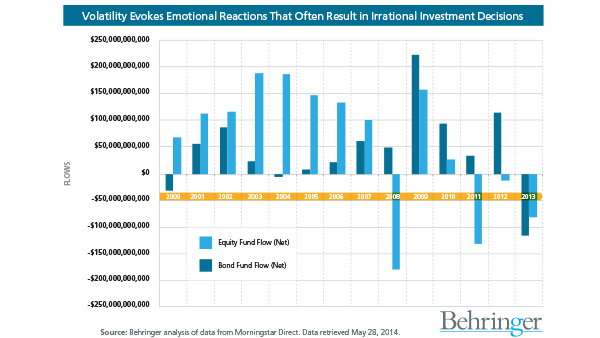 In a perceived crisis, most investors simply respond emotionally and act accordingly. Driven by the fear of further losses, they fail to rationally consider the long-term impact of their impulsive decisions. What’s the answer? Broader portfolio diversification that tempers volatility. Education seldom addresses the root emotions of fear and greed that prompt irrational investor behavior, and its impact tends to fade over time without frequent repetition. A more effective solution is broader diversification that tempers volatility. Lower investment volatility reduces the probability that an investor will develop fear sufficient to motivate a self-defeating decision to sell at the wrong time. A wider range of allocations to non-correlated asset classes can temper volatility, reducing the perception of risk that prompts fear-based selling. Investments in non-traditional asset classes have the potential to further enhance portfolio diversification and provide more comfort for risk-adverse investors without sacrificing real rates of return. Help your clients make smart choices about not just what they own, but also what they allocate to each portfolio component. To construct well-diversified portfolios that reflect the realities faced by your clients today, consider incorporating private debt and equity, where appropriate. (Bear in mind that some investment vehicles may be restricted to accredited investors.) There also is the potential to further enhance diversification for suitable investors with allocations to directional strategies like long/short, arbitrage and spread investing concepts, or the balanced use of leverage. To find out more, download the informative white paper (Diversifying with Alts: Constructing Portfolios that May Reduce Volatility and Fear-based Selling) available at behringerinvestments.com/evolve. This resource helps financial advisors hone their expertise in using alternative investments to help improve long-term returns by reducing the volatility that often tempts investors to do the wrong thing at the wrong time. Behringer creates, manages and distributes specialized investments through a multi-manager approach that presents unique options for allocating capital, managing risk and diversifying assets. Investments sponsored and managed by the Behringer group of companies have invested into more than $11 billion in assets. For more information, call toll-free 866.655.3600 or visit behringerinvestments.com.